Split Scooter / Wheelchair Mobility Ramp Anti Slip. Looking for a lightweight scooter ramp that is easy to store? Look no further! - This split wheelchair/scooter ramp is able to support weights of up to 40 stone, yet can be folded and split into two for ease of handling. 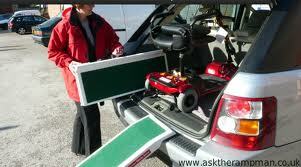 It can be quickly located for use (over steps, into vehicles, etc), but easily folded away for storage when you're finished. 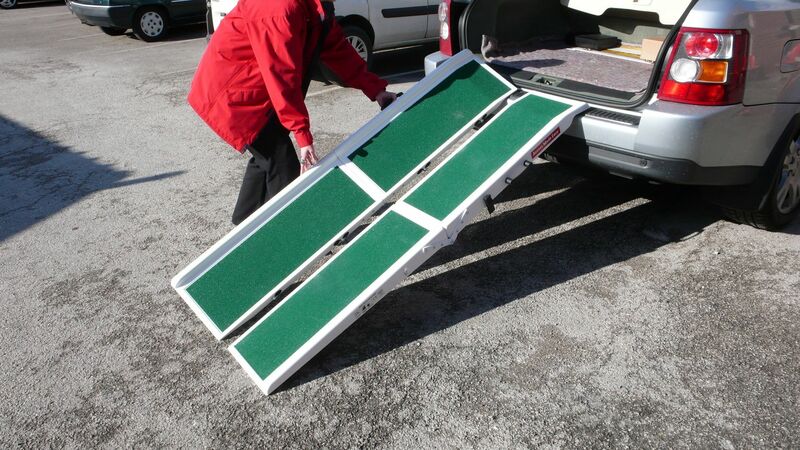 Both halves fit together to make a secure, non slip surface covered ramp that can be used with all types of wheelchairs and scooters. Available in two widths; 28 inch and the wider 33 inch. Length 6ft (1830mm) which folds in half for storage. Nice lightweight ramp , ideal to put my Dads small scooter in the car , and folds easy to transport.